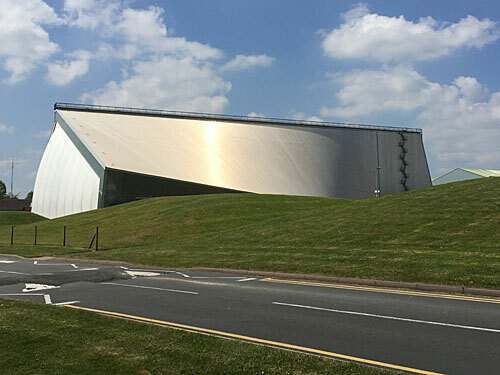 The RAF Museum comes in two halves, one at Colindale in North London, and the other at Cosford halfway between Shrewsbury and Birmingham. Both have free admission. The M54 makes it easy to drive there, or you can take the train, or you can fly in if you get prior agreement with Air Traffic Control. I took the train, alighting at a deserted halt sandwiched between a large airfield and an engineering complex, then yomping along half a mile of grass verge overlooking runways and turf-topped hangars. 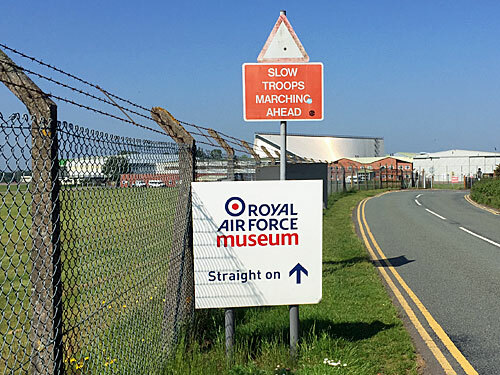 Opened in 1938, the RAF base is still used for training and storage, which is how the museum came to be located here in the first place. Civilians are allowed into one corner of the site with various planes scattered about, including a Nimrod and a VC10, while security checkpoints prevent you from wandering into operational or residential areas. 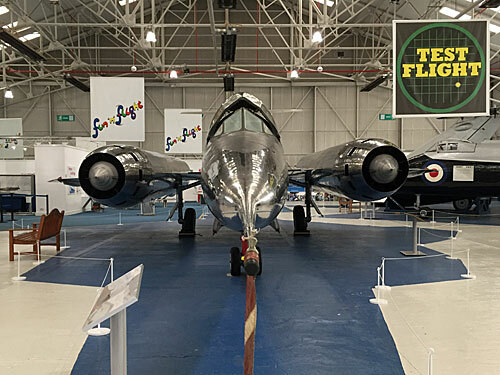 The first hangar is packed with prototype fighters and test flight classics, my favourite being the unlucky TSR2 whose flying career stalled when the Chancellor of the Exchequer cancelled the programme on the day it was due to take its maiden flight. For younger visitors there's a hands-on section based on the science of flight, and for kids of any age a cockpit you can clamber into and pretend you're off to bomb somewhere. 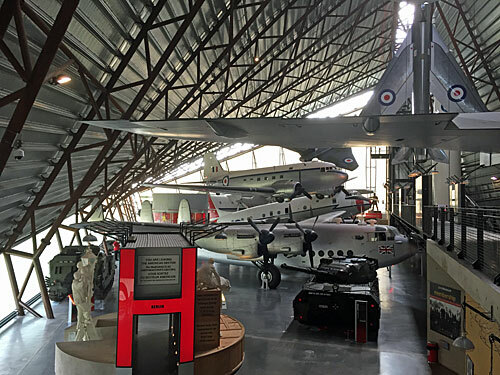 A separate hangar houses planes from WW1 and WW2, from nimble fliers to great lumbering transports, and the museum is also the final resting place of James May's full-size Airfix Spitfire. In a much smaller room I found a cabinet of unlikely RAF mascots, including Wing Commander Roland Rat (from Coltishall), Twinkle Toes the black cat (who survived the first ever non-stop transatlantic flight) and Percy the Parachuting Penguin (copies available for £10 in the shop). So far, so normal, but then comes the Doomsday block. The National Cold War Museum opened ten years ago inside a striking sheet-aluminium tent whose structure is based on intersecting triangles. The interior is split over two levels to accommodate 17 aircraft packed closely at cunning angles, including a Valiant, Victor and Vulcan. As well as turbojet firepower, the display focuses on the story of East-West tension from the division of a continent to the fall of the wall. Pop inside one of the 'silo theatres' to learn about Mutually Assured Destruction or the Cuban Missile Crisis, take the lift to the tiny 2nd floor viewing balcony for a panoramic view, or stand beside a nuclear missile casing and ponder the end of civilisation we somehow avoided. For those of us who lived through all or some of this era it's all very evocative, not least the cabinets contrasting everyday western artefacts with eastern propaganda, including the obligatory mention of James Bond, and a Trabant. The pointlessness of homemade fallout shelters is alluded to, whereas Russia had underground bunkers set aside for 10% of its population, some cunningly doubled-up as stations on the Moscow Metro. As the voices of Brezhnev and Reagan echo around the hall and contemporary news broadcasts play, neither side comes out particularly well. The upper floor is built on top of classrooms and a lecture theatre, so I was pleased to see a primary school party being shown round, exploring some vital non-curriculum history before dashing off to make paper helicopters. 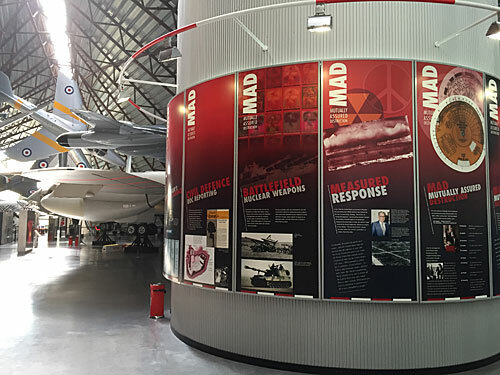 A steadier stream of veterans wheeled through, some of whom perhaps started their National Service here at Cosford, or signed up as fully fledged 'Boy Entrants', as the RAF's cadet force was once awkwardly named. I suspect most visitors come for the aeroplanes rather than the message, but the message is well stated, and a sobering reminder of our global fragility. * Admission is not free on the day of the RAF Cosford Air Show, which this year is Sunday 11th June.